We offer a personal touch coupled with innovation, affordability and years of experience. One stop shop for all welding and sheet metal fabrications. The Company that offers a personal touch coupled with innovation, affordability and years of experience. 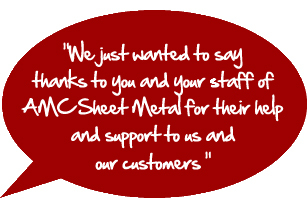 Established in 1985 and based in West Sussex, AMC Sheet Metal Fabrications has grown steadily over the years. We have built a strong and loyal customer base and have excellent working relationships with our customers. Our business policy is the personal touch and we pride ourselves with our quality, workmanship, service provided and quick turnarounds. AMC Sheet Metal Fabrications offers a One Stop Solution in very high standard of fabrication, welding and finishing. We have a very experienced workforce and as a company have a wide knowledge in all aspects of the engineering industry. We have been accredited with ISO 9001:2000 standard and strive for continuous development and improvement. AMC has and will happily undertake projects both locally and nationally, a good part of the goods we manufacture are exported to Europe, Asia and America . We rarely turn projects away and can offer help within the design phase of a project if required. We always allow total access to our management team and shop floor. View all of our machinery which covers a very diverse spectrum of work. Get in touch for more information and to see how we can help you.